Thread: OT: Essential ingredients of a good war film? The Weems and Wellingtons thread started me thinking about the essential ingredients of a good war film. Black and white? John Mills? A true story? I rather like those old black and white films made in the '40s and '50s, which could be termed "historical documents" in that the directors were able to use military equipment which is no longer available, for example the D.H. Mosquitoes in "633" and "Mosquito squadron". Some of my favourites include "Dunkirk", "Sea of sand", "Angels one five", "Twelve o'clock high", "Malta story" etc. Fine actors in these - Richard Attenborough, John Mills (of course! ), Gregory Peck, Dean Jagger, Alec Guiness etc. Scores by great British composers such as Ralph Vaughan Williams...and all those wonderful old aircraft and vehicles. ...is a winner and I can watch "The Battle of Britain" over and over. You often see close ups of watches too. Anyone else like watching these old films on a Sunday afternoon? Thank you for allowing me to join the team. Reading this and previous posts, I know I'll enjoy interacting with you and other ATG NSN 6645 Forum members. When it comes to war films, accuracy and attention to detail is critical for me. I guess it's because I'm a Virgo and that I served 12 years in the regular army as a young man. Yes, the Battle of Britain is one of my favourite films too! I loved seeing those B Uhrs on the wrists of the HE III's aircrew. The Odd Angry Shot is another favourite of mine along with Downfall. The detail in both is excellent. An Aussie film is about to be released about one of our most successful snipers in the Great War, Billy Sing. Billy was born in Proserpine in Queensland and enlisted into the Australian Imperial Force and served in the Dardenelles and later in France and Beligum. Billy's father was Chinese and his mother was British. A preview of the film, The Legend of Billy Sing, which is currently on YouTube, shows both of Billy's parents as european Australians ignoring Billy's ethnic Chinese background. It also shows all western front German soldiers wearing WWII era helmets, Aussie tin hats without lining, it locates Ypres being in France when it's in Belgium. Billy's SMLE is a post WWII modified rifle instead of a historically correct No1 MK III. The German rifles shown in the clip are neither GEW 98 of 98AZ Carbines. Lastly, a shot of the young Billy shooting kangaroos with a Martini Henry Artillery Carbine (a black powder cartridge rifle) shows absolutely no smoke when he fires it! Anyway, I must get my camera out, takes some shots of my small collection and start talking mil watches with the team in future threads. Once again, thanks for allowing me to join the fold. Well for me, best war film bar none, has to be Zulu. For flying sequences Memphis Belle and The 1000 Plane Raid are pretty good. Also on the flying front The Blue Max is impressive and a couple of years ago I went to a reunion dinner and had the privelege of meeting Derek Piggot (who had done the flying sequences for Blue Max, including the under the bridge stuff) who was our guest speaker. Yes! Zulu is an absolute cracker! Each year here in Victoria, the Military Rifle Club hosts it's Annual Competition at an Agricultural College at ******. Zulu is screened every year! I forgot all about Memphis Belle, another all time favourite! Detail is excellent! Amazing aerial scenes. Welcome, Chris - delighted to see you here. Along with Dan and Simon who also joined recently, I'm sure you'll be a real asset to the forum. I'll look out for the Billy Sing film. 2010 promises to be quite an interesting year with three other releases in particular - Peter Jackson's Dambusters remake; George Lucas's Tuskegee Airmen ("Red tails? ); and a dramatisation of Battle of Britain pilot Geoffrey Wellum's outstanding autobiography "First Light". I'm looking forward to some photos of your watches and if there is anyone you would like to invite over, by all means please do so. Hi Chris, odd angry shot was a great film below thw radar here I think.... Jay don't forget 'Achtung'! 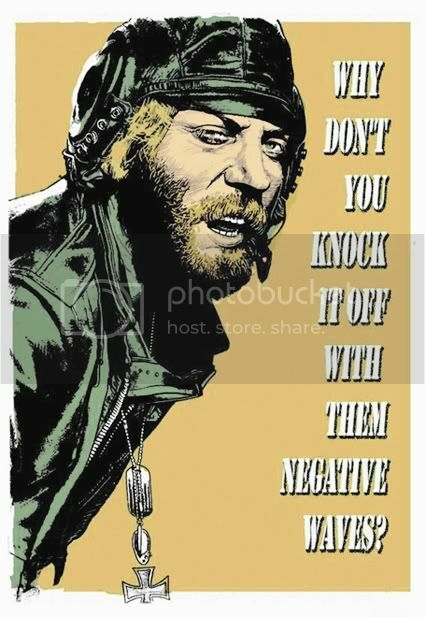 and let's not forget Firefox.....not a war movie but a goodie..
Where Eagles Dare was a great one. I recently watched it and it's not dated at all. Talking of lines, remember this one? "Broad sword to Danny Boy..."
Some great films here. 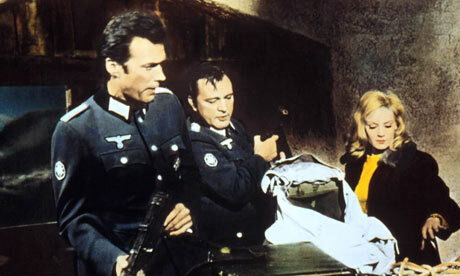 I could watch Zulu and Where Eagles Dare time and time again. But how about "The Silent Enemy" a 1958 film based on Commander Lionel Buster Crabb's earlier war career based in Gibraltar as part of an underwater bomb disposal team. Tongue in cheek in places and not always factually accurate (Laurence Harvey, who plays Crabb wears a Rolex Submariner) but a cracking little film nonetheless. Commander Crabb later went missing, presumed dead, whilst "surveying the Russian cruiser Ordzhonikidze, in Portsmouth harbour, which had brought Russian Premier Nikita Khrushchev to the UK. I also like We Were Soldiers. To my mind a poignant film that touched on the lives of the soldiers wives at home as well. Also a good cameo about the impact the action had on the journalist reporting it.